Need brighter headlights in your C300 with 6 volt system? Want to keep the Bulls-eye lights but plan to go 12 volts with that car? This can work for you. First for those of you with later 300s the Bulls-Eye headlight was used in Chryslers from about 1949 through 1955. So your 1955 C300, when new, came with Bulls-eye headlights. These old headlights were rated at 25 watts on low beam and 35 watts on high beam. By replacing those old bulbs with halogen elements you will substantially increase their brightness, something the C300 owner would probably enjoy if they drive after dark. 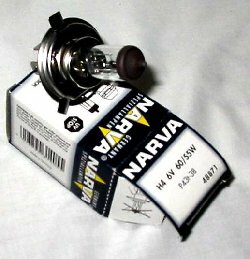 Yes, you can buy new 6-volt halogen bulbs. Even better for those of you C300 owners that have converted your cars to 12 volts and have replaced your original 6-volt lights. Now you can use your old lights with 12-volt halogen bulbs for even brighter lights while maintaining the stock appearance. 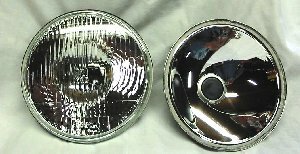 The Bulls-eye headlight is one of the early styles of sealed beam and is made up of 4 pieces, neatly sealed together. 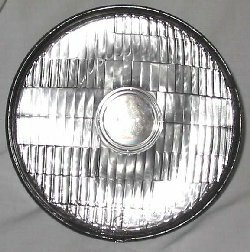 The reflector is light steel and has a bulb soldered in place at its base. The glass lens covers the face of the reflector and has a rubber seal between the glass and metal. Finally the outer edge of the metal is crimped over the edge of the glass sealing it all together. The first order of business then is to disassemble a headlight. 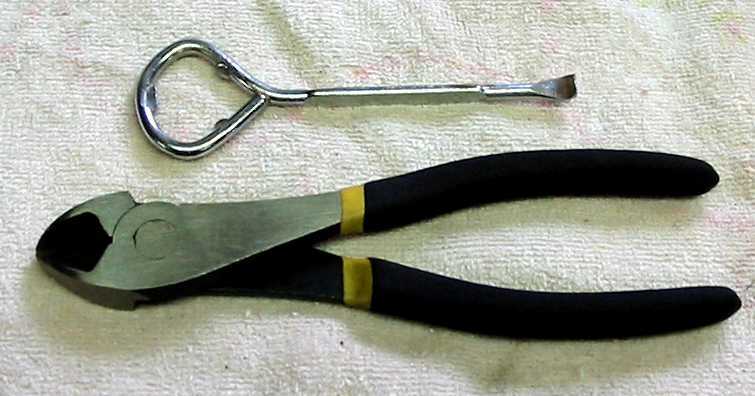 Tools of choice to start this job are paint can opener and side cutters. The paint can opener tip makes an excellent pry tool to separate the parts. I started at the bottom of the light and after prying up the edge I used a side cutter pliers to open up the remainder of the crimped metal. I found that this worked best for me because I wasn't prying against the glass thus reducing the chance of breakage. 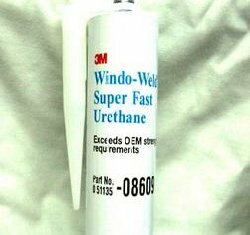 If the lens sticks to the rubber seal between the glass and metal, use some solvent to release it. With the glass removed you will now see the headlight bulb that is soldered into the base. The original plan was to remove the bulb and re-use the base but the plan changed. Having a reflector needing re-silvering is the next problem. Additionally you need to enlarge the hole at the base of the reflector to take the new halogen bulb. Then you also need to find a good way to attach the bulb to the reflector. Too much work and expense without a proper halogen light socket in the reflector. Further research determined that there are at least 2 other options. You can purchase a new reflector that is chrome plated with a halogen bulb base already attached. 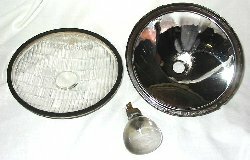 A kit includes 2 reflectors, 2 bulbs and 2 gaskets. The 6-volt kit #ELE207 is available from Restoration Supply Company in Reno, Nevada. It sells for $119.95 plus shipping. The other option that I found is the one that I chose for this article. My local discount import parts man sold me Bosch Halogen headlight units without bulbs for $35 each. He also explained that this unit was being dismantled by some VW collectors to do essentially the same thing that I wanted to do. The lens is glued in so the first thing is to remove the lens. Before starting the lens removal note that the lens is marked TOP. I took a black marking pen and made a mark on the reflector at this spot. This will help me place the new lens in its correct position when it gets glued in place. A very sharp knife will cut through the rubberized seal and enable you to remove the lens. Clean up old adhesive. When all is ready apply new adhesive to the reflector flange. Noting the top of the lens and the top of the reflector put the two pieces together in proper position. For adhesive I used the 3M adhesive shown rght. To make sure that the lens is completely centered on the reflector, slip the stainless headlight retainer over the light and clamp together while glue dries. I used a small bungee cord for a clamp. Install new bulb in reflector and new unit in car. Make sure wiring connections are clean and charging system is working properly. Current draw will increase for the additional wattage in the new lights but the electrical system will handle it OK if everything is in good condition.